The single that the Beatles had recorded with Tony Sheridan in Hamburg, My Bonnie (Mein Herz ist bei dir nur)/The Saints (Polydor NH 24673), was issued in Germany on Monday, 23 October 1961, credited to Tony Sheridan & The Beat Brothers (qv The Hamburg Tapes). Their former bass player, Stuart Sutcliffe, who had remained in Hamburg with his fiancée Astrid Kirchherr, lost no time in sending advance copies to The Beatles back in Liverpool. He sent them to George Harrison, as John Lennon and Paul McCartney had taken themselves off on a trip to Paris. Harrison received the record on Saturday, 14 October 1961 (qv Ask Me Why: When Did Bob Wooler Acquire His Copy Of "My Bonnie"). Ironically, Lennon and McCartney had returned earlier in the week after running out of money. Later that day, on the bus on his way to show the other Beatles the record, Harrison bumped into Bob Wooler, a local compère and disc jockey who worked at the Cavern Club, and who had his own show at Hambleton Hall on Friday nights. 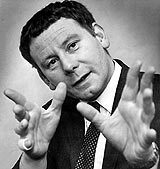 Wooler worked regularly with The Beatles, and mentioned them often in his column, “The Roving I,” which he wrote for the local pop newspaper, Mersey Beat. 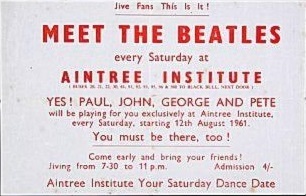 Prior to Lennon and McCartney’s holiday, The Beatles had been playing the Aintree Institute every Saturday night, with Wooler as compère. While they were away, Wooler was working at the Aintree Institute as a disk jockey on Saturday nights. He persuaded a reluctant Harrison to lend him the record, which he intended playing to promote the Beatles’ return to the venue on the 28th October, 1961. So it was that The Beatles’ first single was first played in public in the UK at the Aintree Institute by Bob Wooler on Saturday, 14 October 1961. Wooler promised Harrison that he would return the record when The Beatles played at Hambleton Hall the following evening, but instead he hung on to the record, playing it at every available opportunity and urging people to order the disc from their local record shop. As The Beatles friend, Wooler was hoping that a British record company could be persuaded to release the single. Among the crowd when Wooler played the record at Hambleton Hall on Friday, 27 October 1961 was an 18 year old boy from Huyton named Raymond Jones. The following day, Jones did exactly as Wooler had instructed, and went into NEMS record store, at 12-14 Whitechapel, Liverpool to order a copy of the single. He was served by 27-year old store manager Brian Epstein. According to Epstein in his autobiography, A Cellarful of Noise , he had never heard of The Beatles before Jones asked for the record. This is not entirely true. Like Bob Wooler, Epstein wrote for Mersey Beat, in this case a record review column called “Stop The World – And Listen To Everything In It”. Bill Harry, the editor of Mersey Beat, had shared a flat with John Lennon in Gambier Terrace, and attended Liverpool College of Art with Lennon and Stuart Sutcliffe. As such, The Beatles were given heavy exposure within the pages of Harry's newspaper, which was sold in Epstein's shop and which Epstein must have read. Epstein had been initially surprised by Mersey Beat's revelation that there was such a burgeoning rock 'n' roll scene right on his doorstep that he had not previously been aware of. Sales of Mersey Beat in NEMS were going through the roof, and Epstein began calling Harry two or three times a week to discuss the Liverpool scene. A vague idea began to germinate in his mind that he might manage one of these bands. He approached Jim Gretty, a salesman and guitar teacher at Hessey's Music Store, a few doors down from NEMS, and quizzed him about local bands. 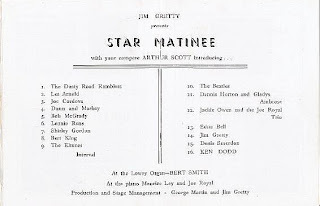 Gretty listed Gerry Marsden, The Fourmost, The Beatles and Rory Storm as the best, and invited Epstein along to a variety show he had organised at the Albany Cinema in Maghull on the afternoon 15 October 1961, in aid of the local branch of the St.John Ambulance Brigade. I got there about 3p.m., and there was chaos. People were walking out because some idiots on stage were making the most terrible row. I said to the producer, "You've got to get these fellers off, they're killing the show." They got them off, and while I was changing, one of these idiots came in and said, "Somebody told me that if we gave you our card, you might be able to get us a few bookings." I threw the card away. Later on, when I worked with The Beatles, Paul McCartney said, "We've worked with you before, Doddy." I replied, "No, you've never worked with me, lad." He said "Yes, we have, at the Albany, Maghull." I asked him "That noise wasn't you, was it?" and he said, "Yeah, we were rubbish, weren't we?" to which I replied, "You certainly were. I had you thrown off." It was not a good advert for The Beatles. They were unsuitable for both the other acts and for the audience. Nevertheless, Epstein went back to Gretty the following Monday, telling him, "Jim, I like those Beatles. I'd like to manage them." Jones came into the store. By the time Raymond Jones came into NEMS looking for The Beatles' single, Epstein could not have failed to be aware of them. 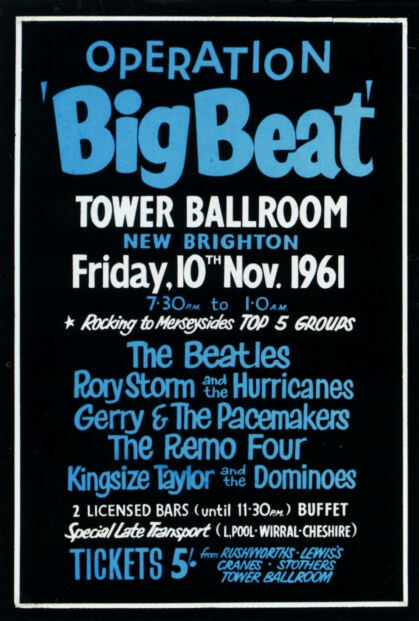 The Beatles were regular customers, and local promoter Sam Leach had arranged for NEMS to advertise and sell tickets to Operation Big Beat, a promotion that he was putting on at the Tower Ballroom on Friday 10 November 1961. 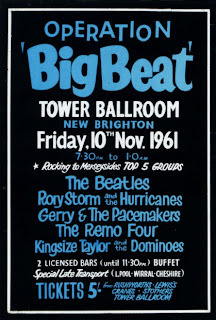 Posters featuring The Beatles as the band at the top of the bill were plastered all over NEMS. NEMS advertised itself as “The Finest Record Selection in the North”. Epstein had a policy that no customer request should ever be turned down. If a record was not in stock then it would be ordered. My Bonnie, being a German release, naturally was not in stock, and it was left to Epstein's assistant, Alistair Taylor, to track it down. The Monday after Jones had requested the record, two girls also came in looking for it. The Beatles' record was certainly not listed in the industry publication, Record Retailer. Although Epstein by now was well aware of The Beatles, he was not aware that their single had not been released in their name, but was instead credited to Tony Sheridan and The Beat Brothers. Following up on the idea that had now been at the back of his mind for some months, Epstein contacted Bill Harry at Mersey Beat, and arranged a visit to the Cavern. He figured that the best way to track down the record was to ask The Beatles themselves. So it was that, on the lunchtime of Thursday 9th November 1961, Brian Epstein and Alistair Taylor walked into the Cavern Club, dressed in their smart business suits. Any attempt at anonymity was lost when Bob Wooler announced Epstein's presence over the PA.
Alistair Taylor: There was this very scruffy band onstage in black leather and black T-shirts. They were fooling about and they weren't very good musicians. But it was the most phenomenal experience I've ever gone through. They were incredible! They just had charisma. Lots of artists have charisma, but they had Ingredient X. You could literally feel the sound hitting you, pounding against your chest. At the interval, Epstein and Taylor went round to the band room. The first person they met was George Harrison, who enquired, "What brings Mr Epstein here?" What brought Mr Epstein to the Cavern was to find out about the record that The Beatles had released. Epstein explained about the demand for their record, got the answers that he was looking for, heard Wooler play the record, then left. Epstein and Taylor went to lunch, where Epstein explained to Taylor that he was toying with the idea of managing The Beatles. A new company would have to set up to manage their affairs, and he offered Taylor a two and a half percent stake, which Taylor turned down, figuring he would be better off drawing a salary from the company. A box of 25 copies of My Bonnie were duly ordered from Polydor in Germany. All 25 sold out in around half an hour, and Epstein ordered a further 250. Realising the popularity of The Beatles, and concerned at the import costs, Taylor contacted Polydor in London, to try to organise a UK pressing of the single, but to no avail. Epstein saw The Beatles play several time over the course of November, and in the meantime quizzed his contacts in the record industry about the relationship between groups and managers. He even visited The Blue Angel Club and spoke to The Beatles' former manager, Allan Williams, who had arranged their Hamburg trips for them, and to whom The Beatles still owed commision. Williams' advice was "don't touch The Beatles with a bargepole". Eventually, a formal meeting was arranged to take place at NEMS at 4:30pm on Sunday 3 December 1961. The Beatles had been playing The Casbah Coffee Club that lunchtime. They had arranged to go via The Cavern to pick up Bob Wooler, who they trusted implicitly to advise them in their meeting with Epstein. Arriving late after they took a detour via The Grapes, they found Epstein waiting on the darkened ground floor of NEMS. Epstein, a stickler for punctuality, was annoyed. but hid it well, asking what Wooler was doing there. "This is me dad," Lennon replied. Epstein put it to The Beatles that he would like to be their manager. However, they would not commit themselves at this point, and Epstein left them to think it over for a few days. In the meantime, he spoke to the Epstein family solicitor, E Rex Makin, looking for some legal advice on the sort of contract he might offer The Beatles. Makin had known Epstein for his whole life, and was sceptical about the idea, convinced the he would lose interest before too long. But Epstein was not to be discouraged. 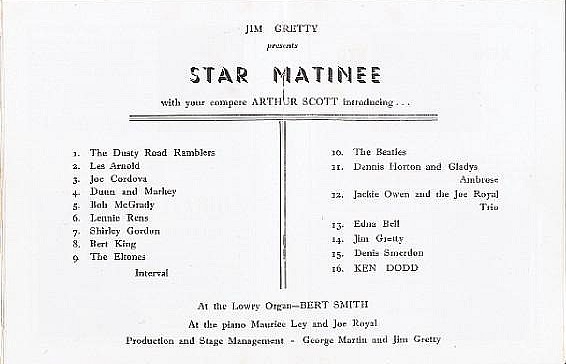 He met with The Beatles again on Wednesday 6 December at NEMS, and put his conditions to The Beatles. He would require 25% of their gross fees each week. In return, he would organise all of their bookings. He also stated that they would never play for less than £15 per date, except for the lunchtime sessions at The Cavern, for which he would double their fee from £5 to £10. Finally, he played his trump card. He would negotiate their withdrawal from their recording contract with Bert Kaempfert, and use his influence to get The Beatles a recording contract with a major British recording company. After a brief but awkward silence while The Beatles contemplated Brian's proposal, McCartney asked if Epstein would influence the music that they played. Epstein assured him that it would not. After another short silence, Lennon spoke up on behalf of the group. "Right then, Brian. Manage us." Another meeting was held at The Casbah Coffee Club, in the basement of Pete Best's home, on Sunday 10 December, 1961. Epstein presented them with a contract that he had drawn up. It is a measure of the man that he had sourced a typical management contract, and had been so disgusted by its mean and exploitative content that he had created his own much fairer version instead. All four Beatles agreed in principle to the contract, subject to Epstein putting his side of the bargain into action. The management contract was eventually signed by all four Beatles in the NEMS office after their lunchtime session at The Cavern on Wednesday 24 January 1962, by which time Epstein had secured them an audition with Decca Records (see The Decca Audition). Epstein himself didn't sign until October 1962, by which time The Beatles were set to release their debut UK single for Parlophone.